Even though I saw Sophia 4 times in 2004, I enter London's Barbican as excited as a child faced with a mountain of Christmas presents. After a short set by The Drones, Sophia take to the stage (singer Robin P.
Shepherd gives the group a collective title, though he is seen as the heart and soul of the band). What should have been an accompanying string quartet turns out to be a sextet, which, in the fabulous setting of the Barbican Hall, is to play an important part in the success of a concert which, if only for 40 minutes, will be full of a poignancy so searing that it almost hurts. 'Directionless' and 'If Only' open the gig, following the order of the album; those not yet familiar with Sophia realise that the price of the ticket has already been worth it, while everyone else is already dreamily singing along. 'I'd rather' confirms the fact that in this album, there's not a false note, while the truly lacerating versions of 'Bastards' and 'Woman' seem so full of suffering that you can understand why Robin sings them with his eyes closed. 'Everyday' ups the tempo a little, but the melancholy takes over again when the first notes of 'Sometimes' fill the air, breaking the final barriers of the heart and shattering it into a thousand pieces. Robin Propper-Sheppard, líder dos Sophia, apresenta-se desconsolado. Atento às críticas do NME que apresenta “The Infinite Circle” como um ex-libris de discos depressivos, contesta, dizendo que até é um gajo divertido. Aproveita para conquistar britânicos com humor. Claro, que lhe damos razão, se, ainda que de relance, atentarmos a outros que apresentam perspectivas de depressão-extrema. Mas o problema depressivo nem é esse. Mais grave ainda. É a penumbra superficial que reside na pobreza das canções, plenas de clichés, e sem fio de ouro. Não fosse a orquestra, todo o pretenso glamour cairia na vulgaridade folk “sring-srang” e a crueza revelada faria Propper-Sheppard estender-se ao comprido. A voz não é “aquela” voz genuína de um Stuart Staples, nem possui a melosidade de um Mark Linkous dos Sparklehorse. E as canções (infelizmente) têm aquela tristeza de adolescente isolado no quarto com uma viola para tocar baixinho sem acordar os vizinhos. O nono tema, “The River Song”, salva a noite. Agressividade eléctrica sem pose forçada de sentados. Orquestra a martelar o mesmo acorde. A introspecção tem destas boas coisas. Quando implode destrói as pulsações negativas. The Drones significa garage rock abrasivo. Guitarras em pundonor ruidoso, laivos punk, e um baixo feminino descalço em vestido colorido. Oriundos de Melbourne, Austrália, a oportunidade londrina apresenta-se sorridente. A emergência de berro leva-os a um entrega reconhecível em palco mas exagerada pela emergência de afirmação. Talvez por isso os ruídos de guitarras escarrapachadas no palco da última música pareçam um acordo prévio, mas perdoável, se for tácito. The latter of the three, for example, falls immediately in the swanky confines of the Barbican Theatre, though, admittedly, that's no thanks to The Drones, who are, it must be said, still a trifle too new  only two low-key albums in, in fact - to be selling out entire big gigs off their own bat, and prove to be, like an impressive number of this instalment's entertainment, deliciously puzzling. There's something of a wistfully folksy look about them, an impression helped along no end by wonderfully-named bassist Fiona Kitschin's barefoot shufflathon, and yet they're actually a clanking titanium nadger of a band, playing songs that are too long, too loud, needlessly complex and ultimately sound like ATP does when you're scrabbling up the stairs between bands. This, inevitably, is excellent. Similarly, it's just as inevitably nowhere near the evening's highlight. For this, ladies'n'gents, is the final night of Don't Look Back, Foundation's frankly inspired idea in which bands play gigs made up entirely of their classic albums, which means that next we get the arguable classic that is Sophia's 'The Infinite Circle'. Mind you, for all that Robin Proper-Shepard makes for an unconvinced frontman, continually pleading that they're not that miserable, honest, he's still leading some underlookedly triumphant stuff, with the band augmented by stringy things in abundance and exuding a sophisticated, dark grandeur. Its terrifically involving and gets treated with justifiable reverence, 'Bastards' is careeringly poignant, and, at times, we think itd be great if Lambchop came on after this and did 'Nixon'. 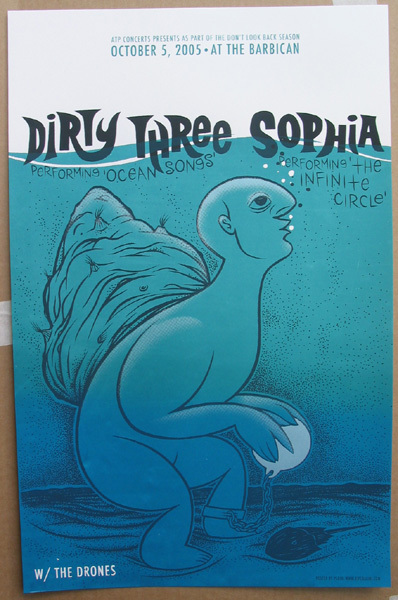 Not that we have any complaints about the elpee we get next instead, seeing as how its the Dirty Three doing 'Ocean Songs', which, as Warren Ellis points out with a perverse glee, is in fact the album that cost them a record deal in their pre-Bella Union days. For one night only, Nick Cave is accompanying them on piano while sporting a moustache of questionable advisement, and the fact that this is the least interesting thing about them is the source of much wonder. Ellis is a captivating frontman, somewhat Cleeseian in movements, desert-dry in his raconteuring, and movingly adventurous on the violin, and it's unlikely you can find many other bands, instrumental or otherwise, being this imaginative and fluid anywhere at all. Moreover, it's really all about Jim White and his hypnotically octopoid drumming; this is a man who will change his drumstick to play one beat just to try and coax the perfect sound out of his equipment, and whose precision windmilling would provoke beauty from whichever instrument he turned it to. He's the greatest drummer we've ever seen, and the Three are a fine enough band to do that justice. Genuinely awesome.